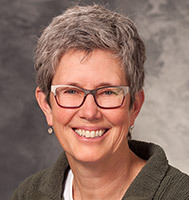 Karen combines teaching and clinical practice for UW-Madison and UW Health. Since 2006 Karen has been a faculty associate for the University of Wisconsin Doctor of Physical Therapy Program, teaching primarily the adult and pediatric neurological track. She continues to practice as a senior physical therapist. She received her Masters of Physical Therapy from the University of Indianapolis. Karen coordinates the UWDPT Global Health Programs, which includes programs in Uganda, Belize, Honduras and Ecuador. She serves on the Global Health Interprofessional Education Committee as a Member of the University of Wisconsin Global Health Institute. Karen sees patients upon physician referral. Karen is involved with research in global health and pediatric neuromuscular diseases, including spinal muscular atrophy.